The number of striped marlin tagged last season (2017-18) was below the average for the last 10 years, although the number of blue marlin (68), shortbill spearfish (22) and swordfish (50) tagged were above the average. The good news is, there were three striped marlin and a swordfish recaptured in last season. John Holdsworth of Bluewater Marine Research, has presented the tagging results to the Highly Migratory Species Working Group, chaired by Fisheries New Zealand. In good years, the number of marlin tagged can far exceed the number landed, as in 1999 and 2016. These tallies do not include fish tagged with New Zealand tags by vessels travelling outside the 200 nautical mile Exclusive Economic Zone. Most notable of these are the large numbers of striped marlin tagged mainly in Australian waters on the Wanganella Banks, by long-range New Zealand vessels. 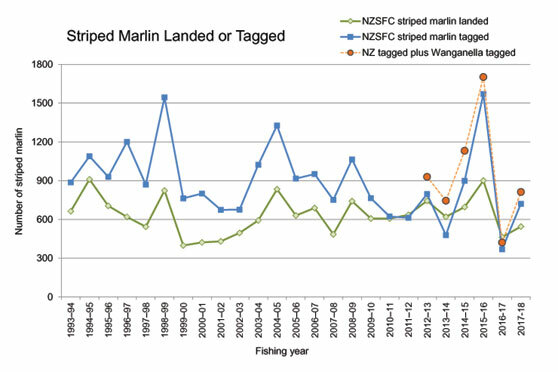 Data from the annual catch tallies in New Zealand Sport Fishing Council yearbooks shows that since 1993-94 an average of 892 striped marlin were recorded as tagged per year, and an average of 632 landed per year. Overall, that is a tagging percentage of 59%. While clubs do weigh and record fish for non-members, there will also be a number of landed fish not recorded, and a lesser number of tagged fish that are not included in club records. Over the last nine years the tagging rate of striped marlin has declined, as can be seen in Figure 1. In part, this decline is due to a structural change in the recreational sport fishery in northern New Zealand. The number of large long-range charter boats which typically record all their catch has declined. The number of well-appointed trailer boats targeting pelagic gamefish has increased. These can launch at a wide variety of locations and are less likely to be affiliated to a club than owners of vessels moored at one port. Tag and release has important conservation and research goals that are supported by the New Zealand Sport Fishing Council. For many years, placing a tag has been the definition of ‘catch’ for fish that are released. Tagging has also been a useful means to collect information on the capture. The introduction of fishing practices from overseas may see more billfish released without tags and a reporting system for untagged fish needs to be developed to record catch information. John Holdsworth says 2017 was a relatively poor year for striped marlin, even though warm sea temperatures saw a number of species range further south than usual. “There were patches of fish available at times, notably in March and April off Ocean Beach, Whangarei, where numerous marlin were seen feeding on schools of bait fish”, he says. East Northland tends to attract most striped marlin fishing effort and reports more tagged fish than other regions. Fishing success in the Three Kings area can be quite variable. 2017 and 2018 were relatively poor years at the Kings and in the Bay of Plenty. Waihau Bay did have good water and good numbers of billfish tagged and released in 2018. 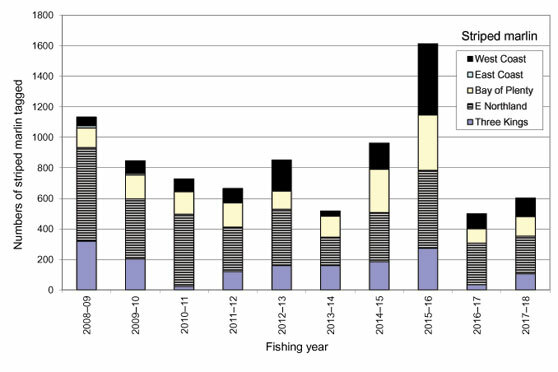 The number of striped marlin landed by sport fishers and the number tagged and released, by year, from New Zealand Sport Fishing Council records. The number of striped marlin tagged and released by sport fishers, by year and region. A striped marlin tagged off New Plymouth in March 2016 was recaptured two years later off Raglan. This fish had a steel anchored tag and was about 110kg on release and weighed 122kg on recapture. A swordfish tagged in April 2016 in the Bay of Plenty was recaptured in mid-January 2018 by a tuna longliner in the outer Bay of Plenty. It was estimated to weigh 100kg on release and 115kg when it was recaptured. “Typically, swordfish and marlin breed in sub-tropical waters in spring or early summer. Tagging shows that some of these fish return to New Zealand in subsequent years”. A striped marlin tagged at the Wanganella Banks was recaptured 150 nautical miles west of New Caledonia on 20 June 2018 by a local longline boat. This fish was released on 30 March 2018 from the vessel Bwana II and estimated at 50kg. Records show it had travelled 700 nautical miles NNE in 82 days. In addition, three mako sharks were recaptured. All were tagged in the first three months of 2017 and all were caught six to nine months later in other countries’ waters. A 50kg mako tagged off Kawhia was recaptured in August by a longliner from Noumea and then released alive with the tag intact. A 35kg mako tagged off Whangarei Heads was recaptured in Tongan waters in October 2017 after 272 days at liberty. A small mako free-tagged (without being hooked) off Tangimoana was caught by a recreational fisher in Bass Strait, Australia, 284 days after it was released. This fish was retagged and released. John says if an angler recaptures a tagged fish, they should provide the same information you would put on a release card. “Please measure kingfish by laying them flat on a measuring board and recording the distance from the nose to the vee of the tail. It is highly likely that a tagged kingfish was measured this way on release”. The information should be recorded on a tag card and sent to fisheries NZ at their new address – see below. Only recaptures with all the relevant information enter the annual lucky draw for $1000 cash. The winner for last year was drawn at the 2018 New Zealand Sport Fishing Council AGM. “Congratulations to Kaifi Muller-Marchie who recaptured a 10kg kingfish in Golden Bay, Tasman, on 27 January 2018. This fish had travelled 208 nautical miles south from Raglan in about 14 months”. Tagged fish can now be recorded online. “We have also been trialling a website that allows fishers to report recaptures and some releases online. “This was set up to assist fly fishing guides who have been using small plastic dart tags to track kingfish they catch in some North Island harbours and on the flats in Golden Bay. There have been some problems with entry of release information but reporting recaptures has worked well. Fishers can upload a photo of the fish and the tag. In future, gamefish tags will have the website printed on them as a reporting option. 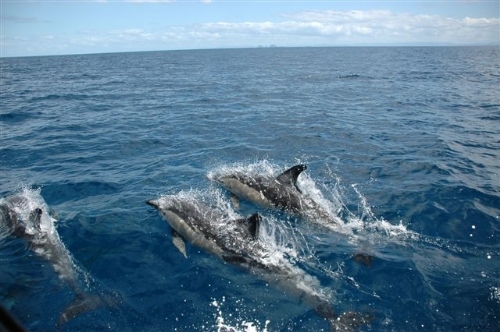 Go to www.fishtagnz.co.nz and click on ‘Report a tag’ recapture. The number of all species of billfish tagged and recaptures over the last decade.